my name is Giorgos and I am from Greece. I have bought my bike one year before in a very good condition.Here isn't a very common bike. I have already put a Delkevic full exhaust system and a k&n filter. I have some pops, so I decided to set my carbs. Also my mechanic advised me to buy a Dynojet kit stage one, because the rejetting will make the bike ride better with the exhaust and the filter. The problem here is that I cant find anywhere a kit for CBF from Dynojet , only for CB 1994 -98. So I want to ask you if this kit for CB from dynojet will fit correct to my beloved CBF. ?? Is that possible. Thank you all in advance! No they are quite different carbs due to the emission regulations on the later model. It is also fitted with a throttle position sensor to adjust the ignition timing. This is probably why dynojet don't do a kit for it. Make sure that there are no leaks on the exhaust system and inlet side too. Switch back to the standard air filter and see if the popping remains, sometimes it's better to just change one thing at a time so you can note any changes good or bad. ok I understand. Thank you. So there is no reason to set the carbs even without the rejetting? It depends on exactly what kind of exhaust system you have as delkevic make lots of versions from standard replacement ones to 'free breathing ' ones. Even though the CBF model uses smaller main jets than the earlier CB models I always found that it would use more fuel. How this helped emissions is a mystery to me. If the engine runs ok at idle and picks up to 4000 rpm ok then just going up a couple of sizes on the main jets should help. A big cause for the popping in the exhaust is the mixture being too lean or weak. 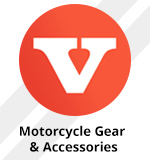 So maybe the kit for CB 500 will fit to CBF 500 . This kit has bigger main jets scale adjustable. The bike runs ok and the iddle is fine. I have more power in low and middle scale but less on the high rpm. Also in high rpm when I open fast the throttle , appears a cut(loss power) and then boost fine. If anyone knows if I can fit the CB500 stage 1 jet kit to my CBF500 please inform me, because I have already one of this kits with main jets etc. I just saw that 6sigma has a kit for CBF. But i dont know if it is similar to CB kit. Dynojet jet sizes are different to normal sizes and in a lot of cases they use different needles and emulsion tubes. So you would be going around in circles trying to get things right. It sounds like your engine is just being starved of fuel at higher speeds so just go up a few sizes on the main jets and see the difference. I have tried the sigma kits and they are really just a selection of main jets and pilot jets that you don't need. I know the theory behind it James, but fundamentally the more fuel you burn the more pollution. Especially if you weigh up the production of the fuel as well. It's not just down to what you can measure from the tailpipe. ok. The main jet of cbf 500 and cb 500 what size are they? Because i didn't understand completly. Can I use the main jets that dynojet has in this kit stage 1 on a cbf 500 carb? Thank you for your replies and your patience. Ok after some research I realised that gave incorrect information earlier. The cbf has a larger fuel tank but still does less miles on a tank of fuel. The dynojet sizes are different to honda or in this case Keihin jet sizes and would be confusing. Try 135 keihin main jets and see if it improves with those. Thanks I send a message to dynojet for more information. I will be back with the information. Thanks! I have some news. 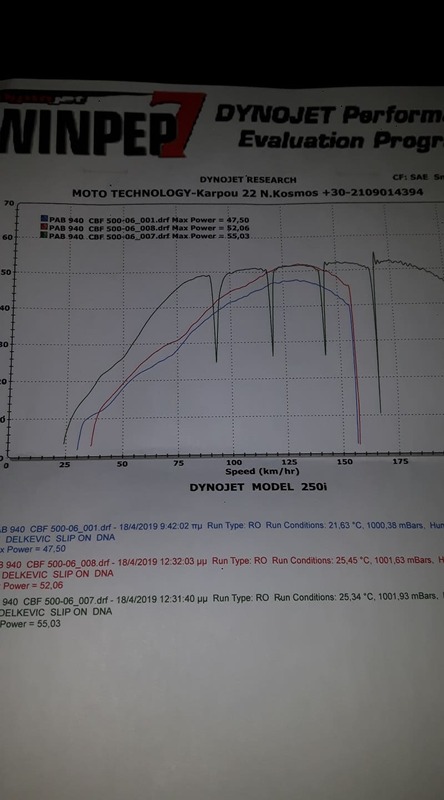 I went to a local tuning garage, which has a dynojet 250 i, for carb adjustment and a dyno run. I have put a kn filter and a delkevic exhaust. The numbers that the dyno show without adjustment was 47,5 hp. After an adjustment in needle scale and a new main jet the number I get was 52 hp. The weird here was that the oem main jet was 128 , he try bigger and doesn't worked so the better solution was 126.The bike was rich at high rpm and poor on low. Now even without the buffle , I haven't almost any pops. It took 8 times on the dyno to get this numbers. What is your opinion about that? I thought that we go to bigger main jet when we free the air filter and the exhaust. Anyone? How do you find those graphs and numbers?